Industry figures have given their verdicts on the first Summer EVCOM, which took place at Olympia London yesterday. 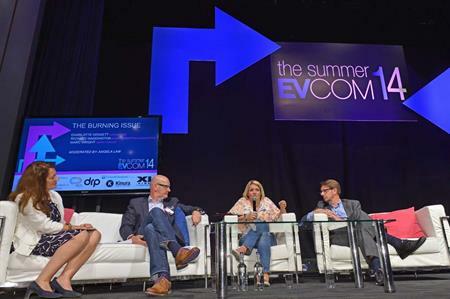 The Summer EVCOM conference attracted 180 registered delegates and, combined with its evening event EVCOM FEST, pulled in a crowd of 200 people across the day, including sponsors and speakers. Last year's Summer Eventia in Birmingham attracted 160 people. EVCOM chair Dale Parmenter said: "EVCOM now has more than 400 members, so I am pleased that we have achieved a 50% turnout. I've worked on other associations that only achieve a 10% turnout, so I'm delighted that we've brought so many members together. The split between former Eventia and IVCA members was 50-50. I'm pleased that one association isn't dominating the other. "Content-wise, it has been challenging and we are trying to push a difficult message at the moment about the need to work together and to collaborate. I'm really pleased with how the day has gone. Now we can focus on the content for Summer EVCOM 2015 in Liverpool, which will be a two-day event with more content for all." Richard Waddington, former First Protocol CEO, said: "In terms of what the event was missing, I think it missed a wrap-up from EVCOM at the end. I would have like to have heard more about EVCOM's future plans. "I was perplexed by the theme of collaboration before I attended, however it worked well. I think there were important takeaways about the importance of collaboration internally for your staff and also with clients. "For exhibitors, I think there could have been more done to integrate them into the events." Alan Newton, business consultant at Newton Squared, said: "This event was always going to be a challenge as the associations only came together so recently. They had to pull together quite quickly an event that met the needs of all members. "I think the value members got from this would very much have depended on the level of the attendee. The best session for me was the last one on the differences between generations – I found it really interesting and useful." First-time attendee Toni Griggs, business development manager of George P Johnson, added: "I cannot compare this event to previous ones, however I thought the theme of collaboration was good. The content was broad, but still focused. The session on storytelling was the best. The talk from Bobi Carley at Disney had good content that touched everyone in the audience in a lighthearted way." Summer EVCOM 2015 will take place in Liverpool from 1-3 July.